Hong Kong is taking extraordinary measures in an attempt to arrest what increasingly looks like a residential property bubble - much of it driven by foreign capital inflows (see discussion). WSJ: - Hong Kong has levied a new 15% tax on property purchases made by foreigners, in one of the government's boldest moves yet to curb speculation in an overheating housing market. Hong Kong Financial Secretary John Tsang said the new measures, which take effect Saturday, show the government's resolve to stabilize the residential market while the easy lending environment continues to boost demand for property despite an economic slowdown. "This is an extraordinary measure introduced under exceptional circumstances," Mr. Tsang said in a news conference late Friday. The announcement comes just days after the city's de facto central bank sold nearly $2 billion worth of the local currency to defend its peg to the dollar, a sign of hot-money inflows from the new round of U.S. credit easing that some analysts fear could affect real estate. The city's government since 2009 has launched many measures to cool the market, such as raising transaction levies, boosting property available for housing development and tightening mortgage terms. But the efforts have done little to slow the rise in prices, as property investments have remained attractive. In fact compared to other Asian property markets, including Singapore which usually mirrors Hong Kong markets, the city's residential property appreciation stands out. 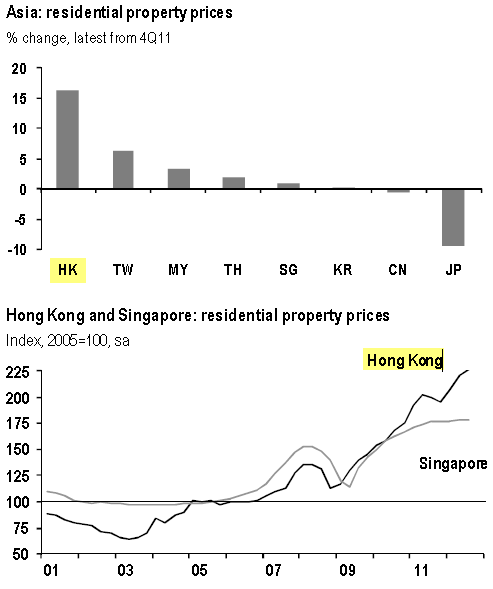 JPMorgan: - Hong Kong, property prices tend to correlate well with Singapore; thus the firmness in Hong Kong property prices during 2H11 and through 1H12 runs at odds with the softening in Singapore. There are a number of possible explanations for this development (and related developments such as the upward pressure on the HK dollar). Some believe this is a play on China and/or funds flowing out of Japan (as Japan's economic conditions dim - see discussion). It seems that asset allocators are rebalancing their Asia portfolios. Whatever the case, the property bubble in Hong Kong looks quite real and the government action may in fact be a bit late. MarketWatch: - Having left it so late to take aim at the influence of overseas buyers, there is now a much larger property bubble to deal with. The government has been warning about escalating property prices as far back as 2009, yet ignored repeated calls to limit overseas purchases.